It is a lot of fun to say out loud: Disdyakis Dodecahedron! 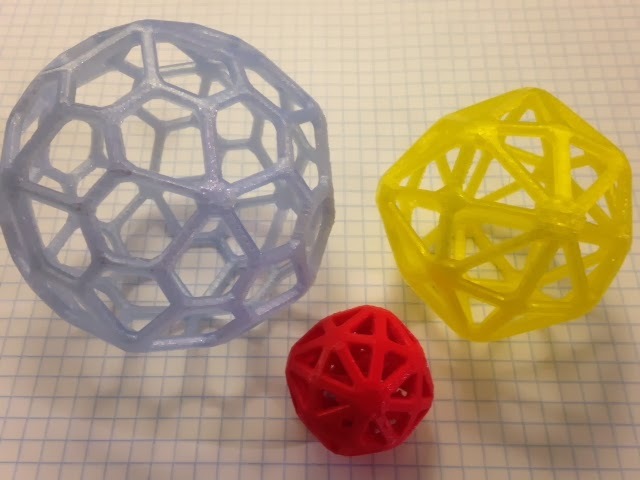 Clearly, next to the open, delicate Pentagonal Hexecontahedron shown in blue, the red Disdyakis Dodecahedron is too small and dense; we need to scale up the model. There are two things to consider here: First of all, we have to scale the model before we create the wireframe, or else the edge thickness will increase as the model gets larger - and we want the edges to look the same in all of our polyhedron models. Second of all, although we could try to eyeball a satisfying scale for the new polyhedron, it would be much better to have some kind of consistent scaling factor that we could apply to all of our polyhedron models. And that's a math problem! Let's walk through the problem. 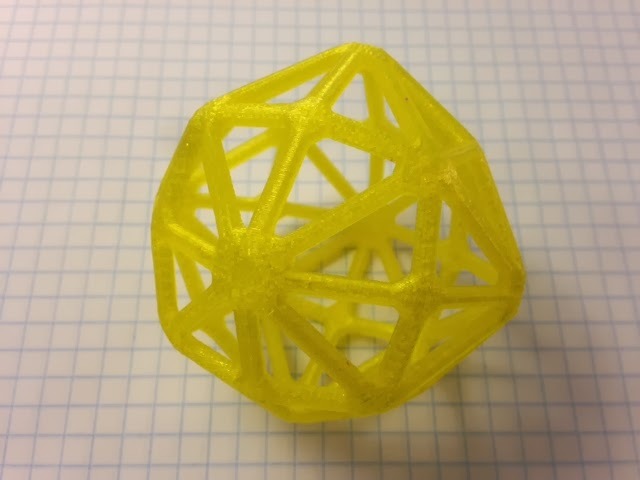 We want to print a set of polyhedra that look like a matching set, even though they will have many different types of faces and vertex degrees. All the initial scaling rules we thought of had problems. For example, we could insist that every model has the same smallest edge length. Not a bad idea, and might make things look pretty consistent, right? Well, it happens that this is exactly what Mathematica does, and since we used Mathematica to get the original polyhedral form for our models, the blue and red polyhedra already have this property! If you look at the picture you can see that the edge length on the red model is actually the same as the shortest edge length on the blue model. Here's another possible rule: Make all triangles the same sizes in all models, and make all pentagons the same proportionally larger size, and so on. Once again, this is already the case for the red and blue models, but the red one is somehow far more dense. One more: what if we let the area of the smallest face be the constant? Well, then models that involve pentagons and hexagons are going to look a lot different than models that involve triangles and hexagons. Nothing is working and we are starting to feel more than a little dense for not seeing the answer. Welcome to mathematics! Note number 1: Usually when I say "we" I really mean "I", since that is how math people talk for some reason and I can't shake it. But today "we" is really a plural, as my husband Phil was a great sounding board and suggestion-factory for this scaling problem. Thank you Phil! Note number 2: I apologize for falling behind on this blog, once again. I knew this post would be a doozy so was procrastinating, and also, life and stuff. The good news is that while I was procrastinating I printed about ten more polyhedra wireframes, so I'll have lots to share with you very soon.